Unlike many so-called product reviews which merely repeat manufacturer’s claims about the features, benefits and performance of their products in an effort to make a profit on your purchase, this is an actual User Report based on my personal experience with the product and the manufacturer. This is a rewrite of my user report about the GP-PSK-120 Portable Solar Power Kit that I originally published in July of 2014. In that report I gave the product a Don’t Buy recommendation. Since then I have decided that I prefer not to make buying recommendations on products about which I write user reports in favor of presenting a factual report about my experience the product and/or company upon which people can base their own buying decisions. Also, since my original report Carmanah, the maker of the GP-PSK-120, has changed the solar controller they supply in the kit, as well, I’ve been told, as the way it is mounted. I have not had a chance to use the updated kit but from what I’ve been told it appears to me the new mounting methodology of the controller would seem to be an improvement. Apart from the way the older style controller was mounted, the photo of the newer controller shown on the GoPower web site shows a digital display which in my opinion is an improvement over the LEDs of the older controller. Because I am unfamiliar with the features and function of the new controller I cannot comment on it beyond that. Both of these things appear to represent improvements and I expect they do. At the time of this rewrite I have owned and used the GP-PSK-120 for about two years both as originally supplied and with a replacement Blue Sky Sun Charger 30 (SC30) solar controller that I added later at an additional expense. 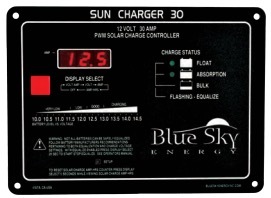 The Blue Sky Sun Charger 30 or SC 30 for short. 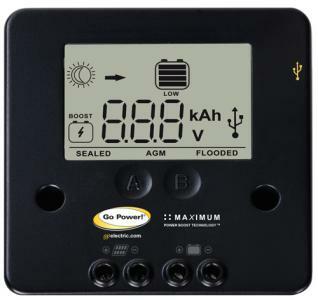 It’s a multi-stage PWM solar controller than can handle up to 30 amps. I replaced the EPSolar controller on my GoPower portable solar panel with this unit. It allows for many user programmable functions and has a digital display that shows amps and volts plus it keeps track of how many ampere hours have been sent to the batteries. Nice! It will mount flush and can be installed into a sturdy metal box available separately. I concocted a temporary method of attaching it to my portable panel with velcro until such time I could install it inside my rig. The Don’t Buy recommendation I issued in my original report was based in large measure do to what I regarded as failed tech support as well as questionable performance of the included charge controller made by EPSolar. The controller didn’t seem to be performing as it should have and nobody I was able to reach at the company seemed able to tell me whether or not the it was performing properly. I am changing nothing about my report with respect to those things, but I want readers to know that despite those shortcomings as I saw them I have both used and relied upon my modified version of the GP-PSK-120 for a good long while and am pleased with performance which I believe can be attributed to the SC30. This little panel provided the bulk of electricity for me during an 18 month trip living full-time in my RV. If I had good sun and didn’t go crazy with electrical my consumption my modified Blue Sky/GP-PSK-120 set-up. This included charging my iPhone, iPad and running my laptop. I also charged my electric razor, beard trimmer, toothbrush, handheld vacuum and ran my blender. Although rated at about 6.7 amps maximum output I observed output slightly above that level at times when there was good sun and I had a load on the batteries. I bought this item in order to charge the coach batteries of my motorhome. It includes two 60 watt solar panels mounted in a frame that folds neatly to about half the size of what the two panels would measure when placed side by side. Together the panels create, in theory, 120 watts of power. (In practical applications I don’t think any solar panel from any company will produce at its maximum theoretical rated output.) The construction seems adequate and based on the electrical output of the panels as measured before the electricity gets to the charge controller the panels themselves seem to perform as claimed. Separate from the panel the other major component of the kit, and perhaps the more critical of the two, is the charge controller, the job of which is to modify the raw output of the panels in order to make it useful for battery charging and to optimize the charging of the batteries. This is where I had a question that I was never able to get answered by Carmanah. Based on what I was told by tech support and information provided in the literature provided with the product I was never able to confirm whether or not I had not a properly functioning unit. Tech support seemed to think I did not and they sent a replacement which performed pretty much the same as the original. The shipping costs I had to pay and inconvenience involved were both considerable and in the end I decided to purchase the SC30, which, by the way appears to do a better job than the original controller. I’d hope so: the EPSolar model that came with the GP-PSK-120 can be had online for less than $25 whereas the Blue Sky unit is closer to $150. 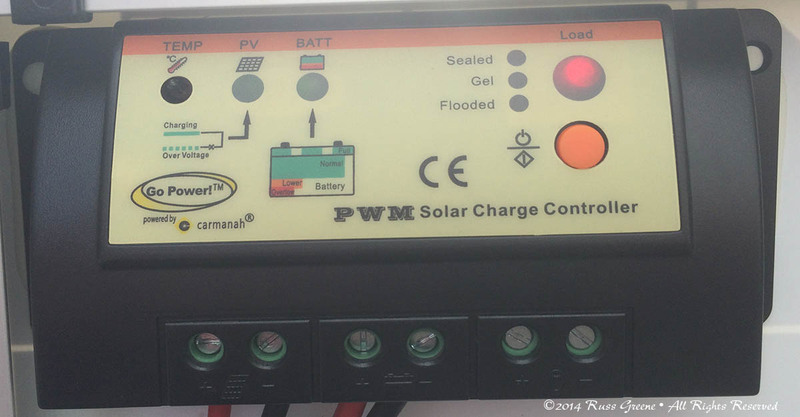 One complaint I had when I wrote my original report was that because the solar controller was glued to the back of the solar panel it necessitated shipping the whole 30-plus-pound kit to Carmanah for replacement. That’s a big, expensive deal. Had the controller been mounted with a couple screws it could have easily been removed and shipped much more easily for much less money. Carmanah has since changed the way they mount the controller so that it can easily be removed. This is a welcome change and they way it should have been done in the first place. The controller provided with the unit when purchased was not waterproof. Documentation provided with the panel recommended against getting it wet. I thought then, and still do, that attaching a controller that isn’t waterproof to a solar panel intended for outdoor use was a bad idea. It rains outdoors. While the original controller was attached to the panel in such as way as to afford some protection against rain, in a storm with any wind or even just folding up the panel to put it away it would be possible, even likely that the controller would get wet. Wouldn’t it make more sense to use a controller that was waterproof or put it in a protective housing? In all fairness, probably all portable solar panel kits are going to have their controllers attached to the panel in some fashion. There really isn’t anywhere else can they put it, but in my opinion it should be adequately protected from the elements and it should be easily removable in case somebody wishes to relocate it inside or needs to ship it for repair or replacement. The solar controller which has replaced the EPSolar controller that was part of the GoPower kit when I bought mine appears to be an improvement over its predecessor if for no other reason than it incorporates a digital display that provides valuable feedback to the user unavailable via the LEDs of the earlier controller. I can’t say if it will perform any better than the controller it replaces, but I will say that I have my doubts about any controller that does not allow the user to adjust charging voltage for each stage of charging as well as the duration of each stage. I don’t think that sort of control flexibility is going to be available with a controller in any portable solar panel kit, however (it would prove too costly), so this shouldn’t be taken as a negative against the GoPower product any more than it should with the others. This is the newer controller being used by GoPower since I bought my soar panel kit. It would seem to represent an improvement if for no other reason than its digital display compared to the “idiot” lights of the previous EPSolar controller. In my initial report I wrote that GoPower does not service the product beyond the warranty period. From their website “…we do not repair out of warranty products and do not have any authorized repair agents.” Although the wording on their site seems to have changed a little since then the policy as I understand it appears to be the same. The panels in this product are warranted for 25 years, but the controller only for three. My RV family at Cottonwood Campground, Theodore Roosevelt National Park, ND: PeeWee my motorcycle hiding under his cover, rear left; Charlene, my RV, and Sunny, my solar panel. 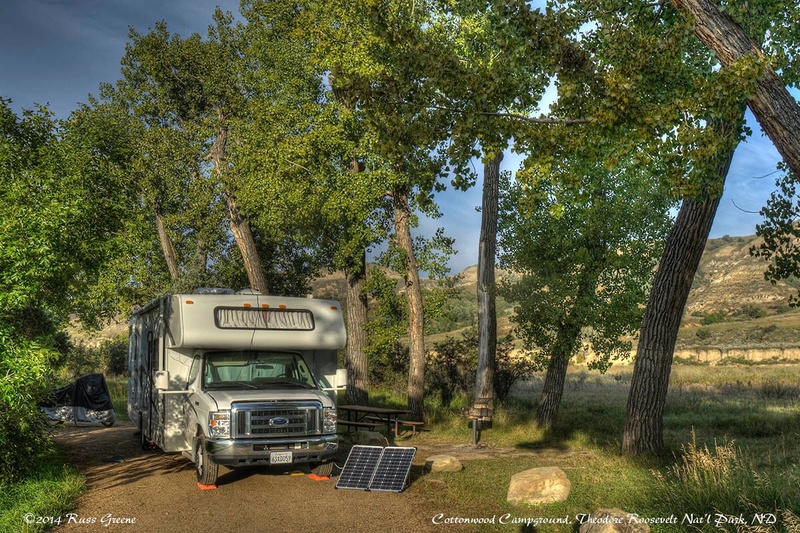 Here my panel is in the sun but my RV is largely in the shade–one advantage of portable solar panels. 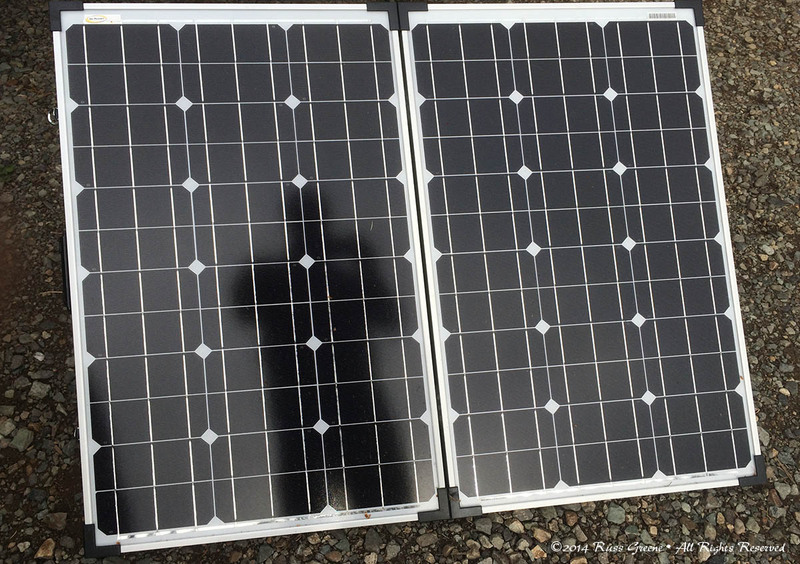 Separate from the merits and shortcomings of the GP-PSK-120 is the discussion of portable vs. permanently installed solar panels and I think it’s worth delving into this as part of this article. Each has its advantages and disadvantages. A permanent installation may cost more and the panels will be in the sun or shade depending upon where you park. A portable can be placed in the sun while you’re parked in the shade if the situation allows. Repositioning a permanently installed panel so as to better face the sun can be difficult or impossible at times whereas a portable is easily repositioned. Permanent installations can produce power while you drive. Portables require set-up and tear down every time you relocate. Permanent roof-top installations may be less subject to theft than a portable left on the ground. A portable may be easier to take with you to your next rig or sell separately from your rig. Undoubtedly there are other considerations when looking at portable vs. permanent but I wanted to mention a few here. Along the lines of summing up, when it comes to solar power as it pertains to RVing I have come to believe there is a great deal of ignorance amongst the buying public and within the retailing community as well. I’ve also decided that manufacturers of solar products as well as RV manufacturers themselves often do little by way of intelligent or efficient solar panel/charge controller installation or in those cases where rigs are advertised as “solar ready” that the prewiring is not well thought out and is little more than a marketing gimmick. When it comes to portable solar panel kits I think it is not unreasonable to expect that if you want things done really well you will might have to modify any kit you purchase such as I did with the GoPower kit I purchased. From that standpoint I think the GoPower product is likely to be as good as any. Here is a link to portable solar panels on Amazon.com, and here is one to the GoPower PSK-120, the subject of this report. If you have found my report useful please use it to investigate or shop for a portable panel, or for anything and everything else on Amazon.com. Thank you. I’ve written more about things I’ve learned about solar here.